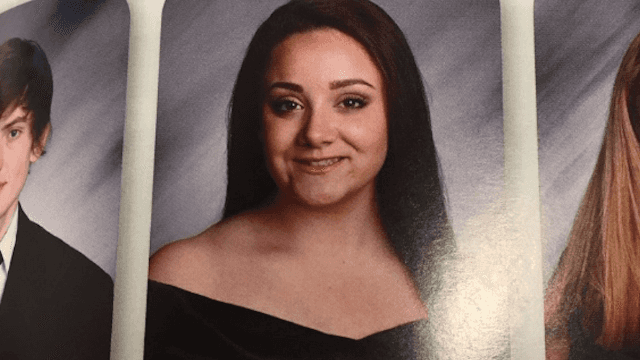 Teen hilariously blasts her school's hypocritical dress code in senior quote. 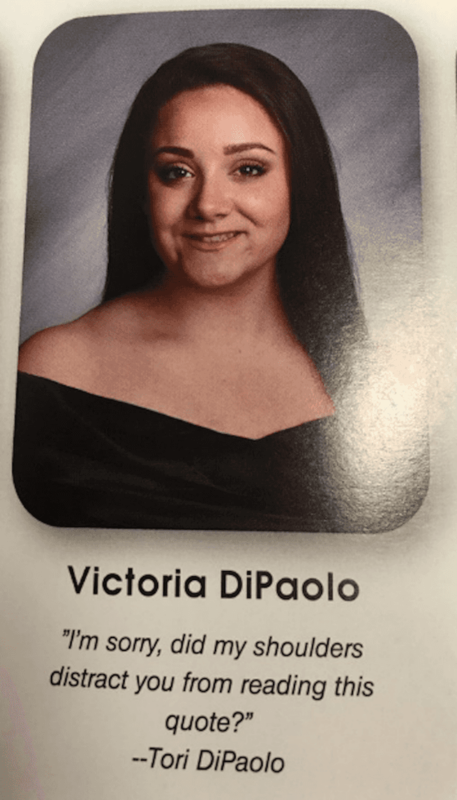 Most high schoolers use their senior yearbook quote to wax sentimental or impart words of wisdom on the graduating class, but Victoria "Tori" DiPaolo, a senior at West Milford High School in New Jersey, used her to call out hers school's sexist dress code and it. is. amazing. You know, usually people who quote themselves are annoying, but this is so awesome that we will let it slide. DiPaolo uploaded a picture of her senior quote onto Twitter on June 13th, and so far it has racked up over 500 likes and 190 retweets. According to Yahoo Style, the West Milford High School’s official dress code prohibits halters, half-shirts, shorts, sweaters and blouses that expose breasts or stomachs, or anything clothing with rips, tears, or holes that cause the clothing to become "revealing or suggestive." Exposed bra straps and (gasp!) shoulders are completely out of the question. But DiPaolo told The Huffington Post that she had a reputation for combating the school's dress code long before she mentioned it in her yearbook quote. While my school, as well as most others, have dress codes that apply to boys and girls it’s usually only girls that get dress code violation. My school’s dress code prohibits boys from wearing muscle shirts but they do all the time and don’t get in trouble yet, when my bra strap accidentally slips I have to miss class time to go change. I just think dress codes need to be enforced on both genders if you’re going to choose to have one. But really, people not being allowed to wear tank tops is ridiculous, no one is distracted by shoulders and that’s really where I got the inspiration for my quote. The quote even went over well with those who have to carry out the ridiculous dress code— the school's administration. Well, most of the administration, anyway. "One of my teachers actually came up to me to tell me she loved my quote and thought it was hilarious. Most teachers have laughed at it. The general consensus at my school — unless you’re the principal — is that the dress code is ridiculous so people have loved the quote so far," said DiPaolo, adding "Really, I just wanted to get a few laughs."